Scientists are interested in transforming natural sounds in order to understand them better. 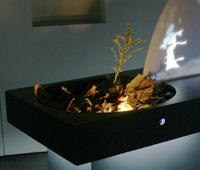 The EcoPlayer, or Ecological Audio Environment, is a multimedia device for experimenting with sound. In this exhibition, users move blocks to modify location, pitch, tonality, and range, which allows one to explore changes in sounds made by animals. Social Evolution is an experiment in simulated societies. Digital characters walk, move, eat, run and sleep while interacting with one another. Displayed publically on a busy street, these characters act as a mirror, questioning the pace of life as real people go to and from work. Iimages on the theme of Love. Lifecycles explores the cyclical relationship between physical and digital worlds. 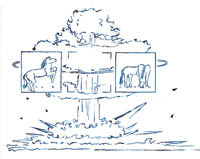 Natural elements of water and wind exist as both real and virtual elements. In this work, a wind-water cycle is created in which half the cycle takes place in the real world. Lifecycles references the human condition in which our own experiences, and actions, are simultaneously both physical and mental. Presence recalls the memory of nature. 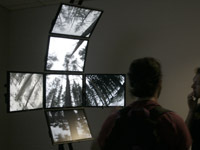 Six high resolution displays allow visitors to see and navigate very detailed forests, recalling the memory of natural experiences. Trees appear rich, tangible, and detailed, extending up over the viewer as they do in nature. Video generated and modeled in real-time using LUNA software. Is it possible to remove the technological aesthetic from structuralist art? The art world has embraced the scientific aesthetic, but art is not science. If its only purpose is to reveal structure, then it is no better than science. Is it possible to convey human qualities of emotion, compassion and feeling through abstract, purely technical forms of digital media? 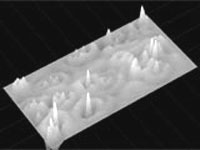 Timewave comments on our perception of science by exaggerating scale, revealing the microscopic in a way not possible with current scientific methods. Recent biological investigations reveal that the collective behaviors of social insects such as the construction of nests can result in complex emergent structures. Collective Morphology is a collaborative interactive exhibit in which viewers user their hands to collectively create an emergent form. These works explore the physical concepts of energy. Referencing the atomic, Energy consists of a sphere suspended via Slinkys in a cube-shaped room. The slightest motion - even a breeze due to walking - causes the sphere to vibrate non-linearly. Clacking rythmic patterns, these robots are an expression of living communities acting in concert. As the world becomes increasingly populated, it also becomes a truely global living community. The actions, reactions, decisions and beliefs of each individual contribute on a very large scale to affect global change and to direct the future of civilization world wide. This aging robot it not a polished, finely tuned machine built on new technology in its infancy. Rather, it is an expression of aging, and the process of decay which leads to a deeper appreciation of ones limited place in the world. The 150 lb., 8-legged robot slowly, grugingly, pulls away from its control mechanisms, eventually backing into the far wall. Inhale,Hold,Exhale is an investigation of the body and form of technology. Like blue whales, these large inflating creatures breath with their own slow rhythmic pulse. Actively breathing in and out with two fans each, this community of robots gives the sense of an ancient, mythical, yet technological creature. This work expresses the shame and guilt that come from technology, which is capable of great advances but also of great violence against other humans and against nature. The Land of Shameful machines is where we find ourselves when promising technology is incorrectly managed by scientists and politicians. Icarus, the mythic son of Daedalus, perished by flying too close to the sun on wax wings. Here, Icarus is born with a VR visor representing the dreams of technology (flight). At the moment of birth, his Cephalopodic body expresses the inner tension between the benefits and perils of living a technological life. The Ravaging of the Queen is a reference to Max Ernst's Robing of the Bridge (1939). Usually represented as stereotypically angelic, women are often portrayed in popular media as spiritual, natural saviors of mankind. Here, the crow, intertwined with the female form, represent the dark qualities of women. These composites of real and digital images of the Roman Forum reconstruct the ancient world of the Romans as a futuristic technological civilization. Like a dream, the images of the ancient past create new images of the future. Will machines ever achieve the magical, natural, dynamic complexity and biodiversity of the living world? Butterflies and Beetles juxtapose the rigidity of technology with the inescapable, expressive, even comedic complexity of nature. While we may theorize that robots and nature have the same mechanical basis, for the present the biological world far outpaces our machines in complexity, power, and flexibility. Beetles move over the surface of a rigid machine as if it were a toy. These figure studies explore the body in relation to geometric form. Expressions in the character give rise to expressions in the surrounding forms. The grayscale palette was choosen to place more emphasis on expressions present in each pose. This classical male figure was modeled in Maya for use in education. The mesh includes a low-resolution head and body, a high-resolution subdivision mesh, and a skeletal rig with IK controls for joints and limbs. This rig is free for any use. QUANTA is a prototype for a visual internet. Using multiple methods in information visualization, Quanta allows users to navigate timelines, spatially explore concepts, and browse events across disciplines. Quanta provides multiple dynamic visualizations drawn from a semantic database of interdisciplinary data. This periodic table shows a quantum picture of the Atomic elements. Unlike the classical view, with electrons orbiting the nucleus like planets, this Quantum Period Table shows atoms a true probability clouds by making some simplifications of their true complexity. The circulation of checked out books and media transforms the Seattle Central Library into a data exchange center. This flow of information, showing the circulation of books over the past hour on six large plasma screens, indicates what the community of patrons considers interesting at any specific time. Newsflow is a concept project designed to explore the relationship between news media and geography. News articles over a given time period are examined to show how news occurs and propogates spatially. The visualization combines geography with 2D hyperbolic space, to show the proximity of articles both in concept space and physical geography. A study of variation in form. 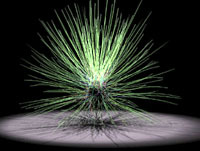 Pods resembling seeds are animated in real-time with increasing surface variation. We absorb generative art on a psychological level, as a tangible experience of the persona. Thus, despite the human-like joints, and biological references, The Bones of Maria is not only a study in physiology - it is the subjectivity of her character brought into the tangible world. These synthetic flowers are motifs of mathematical perfection. Is it the activity of life and growth that cause us to experience nature as beautiful, or is it a perfection of form? Les Motifs is a digital simulation of growth and form, similar to organic art, but abstract away from the 'plant' or the 'tree' -- these are synthetic motifs, unrealized flowers. Wavesound is a simulation and sonofication of raindrops on water. Greatly slowed down, wavesound uses scan synthesis to recreate the sound of the simulated water surface. The water surface is thus played like an instrument, with the sound generated simulatenously. Microspheres is a simulation of structures in molecular physics. Molecules interact by randomly combining and breaking apart under specific circumstances. The result are molecular structures that progressively build more complex, geometric shapes, then break down back into simple molecules. The compass and straight edge are the basic instruments of Euclidean. 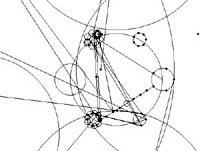 Geomgen uses these principles to generate unique works of art. 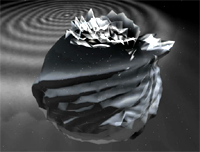 Unlike most fractals which are iterative in a deterministic way, Geomgen uses a simple set of rules probablistically. Occasionally it will decide to bisect a circle, to subdivide a line, or connect two points with a line. The result is a huge range of simple geometric images. Particles under gravitational force show unusually complex behavior. Much like the Bubble Chamber, which is used to photograph sub-atomic molecules, in this particle system the historic traces of spheres under graviational motion are drawn onto a surface, describing volumes and shapes created from motion.